Alvin started his Logistics profession through his family business HUB Distributors Services, a local SME 3PL firm in Singapore since 1988. As a forward-looking 2nd generation business leader, Alvin brings more than 6 years of experience in business development to grow & corporatize the company through innovative technologies, increasing the Group’s revenue by 20% YOY. As the founder and previous CEO for HUB Logistics, a sister company of the Group that focuses on the container haulage services, he’d successfully built it up from scratch to a sizable fleet consisting of 15 Prime Movers & over 100 trailers within 3 years; moving 1,000 TEUs on average per month. 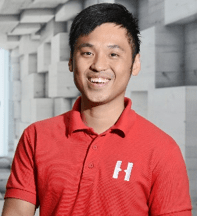 With a keen interest in making a difference, Alvin is always taking on an active role in the industry’s transformation road map and is now the Co-Founder & Chief Executive Officer of Haulio. He will be responsible for strengthening the brand’s presence, driving supply and demand, as well as business development for the startup. SHOWCASE: Skunkworks / innovation in the supply chain industry.